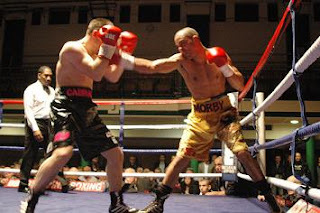 Former WBU Lightweight Champion, turned promoter, Graham Earl promised closely matched, exciting fights on his return to York Hall on Saturday night with his ‘Capital Punishment’ event. Being a man of his word, that’s just what Graham delivered and much, much more. 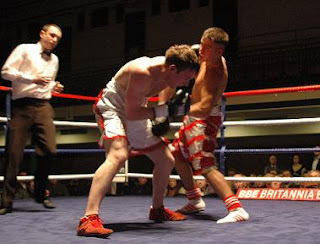 For a start there were no less than three drawn bouts, albeit two being declared under the new BBBofC ‘technical draw’ rule. There was a massive upset, when Alex Spitko stopping Navid Iran. There was bloody drama when two fights were stopped due to bad cuts and there was controversy as Manny Oshunrinde was denied a clear stoppage win, only to receive a ‘technical draw’. More on these a little later. 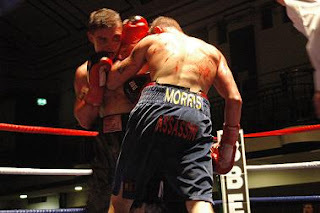 The headline Southern Area Super Middleweight title clash between Paul Morby and Daniel ‘The Slick’ Cadman was a closely fought affair, so much so that after ten hard fought rounds the Referee declared the bout a draw. The bout got of to quite a slow start as both protagonists feeling each other out, as such it was impossible to declare a clear leader after the first couple of rounds. Cadman had set his stall out, deciding to close the Champion down. Whilst Cadman did all the controlling it was Morby that landed the more meaningful punches, just not enough. Round three was a much more lively affair, with plenty of back and forth exchanges. About midway through the round the crowd leapt to their feet as one as Cadman backed Morby onto the ropes and let rip with a powerful flurry of shots. Cadman was driven on, to try and finish the fight early following landing a vicious left to the body, that clearly hurt the Champion. Morby survived the onslaught but round three was clearly Cadman’s. Cadman again seemed to hurt Morby with a an equally vicious left to the body in the fourth round. However this was the wake up call the Champion needed, Morby came back with some world class ring craft and salvo of punches of his own as he boxed his way out of trouble. Whilst again a very close round I felt that Morby had done just enough to claim the round. Round five was all Cadman. The reigning champ showed he has the heart of a Lion, soaking up onslaught after onslaught , any of which looked sure to end the Champions reign at a moments notice. At times the round got messy, as Morby clung to Cadman in an effort to stop further punishing salvos. Cadman’s round for sure. Round six was more or less an extension of the later part of the fifth, with Morby grabbing hold of Cadman each time he mounted an attack. Saying that there was some scintillating action, just more holding than action. Again I gave the round to Cadman as he was by far the more positive and landed the more meaningful, and hurtful, punches. Round seven was again a close round, like in the previous rounds there was a lot of holding, but there was also plenty of back and forth action. I gave the round to Morby purely as he had landed the more telling punches. Round eight saw some excellent action, between the holding that is. Again another very close round, this time I just couldn’t split the pair. Round nine was a scrappy affair, but did include some fiery exchanges, as well as some rather amusing moments - first Cadman is sent head first through the ropes following some nifty footwork by Morby, who sidestepped an attack before spinning the flaying Cadman head first through the ropes. Just moments later the tables were turned when Cadman stepped aside, matador style, as Morby charged forward. Morby’s pace was such that the momentum almost propelled him completely over the third rope and onto the officials table. Finally following another grappling session Morby gets pushed down to end up kneeling in front of less than amused referee. At the end of the three minutes again it was impossible to declare a clear winner of the round. With just the one round to go this fight could go either way. Morby comes out hard and fast but Cadman doesn’t seem fazed and stands his ground. Following yet more grappling sessions, interspersed by some scintillating back and forth action. Both gave there all, it was without doubt a magnificent, and again too close to call, final round, even with the holding and pushing, and truly deserving of the rapturous applause that ensued as the final bell rang. 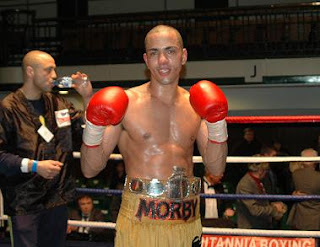 The cheers quickly turned to jeers though as the referee lifted both Morby and Cadman’s hands high declaring the fight a 96-96 draw, as such Paul Morby gets to retain his title. Hopefully there will be a rematch in the not to distant future. Prior to the headline bout American Super Middleweight Emmanuel ‘Manny’ Oshunrinde was clearly robbed of his first win on British soil by the fight being declared a technical draw following the fight being stopped, in the first round, due to a serious cut over Smyle’s right eye. Unlike the earlier technical draw decision, when a cut was caused by an accidental clash of heads, the cut to Smyle’s eye, as well as a serious swelling below the right eye, was caused by the many solid and highly accurate jabs and punches Oshunrinde landed throughout the short encounter. Both protagonists started fast, however Oshunrinde quickly took control with his superior jab, often forcing Smyle backwards. Around half way through the round Oshunrinde again sent Smyle backwards, but this time followed up and let rip with a big left-right to the head. Smyle covered up quickly, but not quick enough to stop another heavy straight right. Oshunrinde looked set to continue the onslaught but the eagle eyed referee had spotted the blood gushing from a cut above Smyle’s eye and called a halt to the proceedings. The highly anticipated clash between Ultrachem TKO’s exciting London based Dutch Cruiserweight prospect Mitchell Balker and Battersea’s fighting Fireman Nick ‘The Ox’ Okoth proved to be one of the fight’s of the night. Balker’s savvy ring craft proved to be too much for ‘The Ox’. 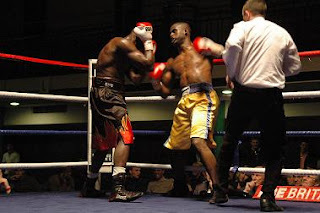 Right from the start Balker controlled the fight utilising crisp jabs to keep Okoth on the defensive before moving in to land solid jabs and right hands before stepping aside to thwart any return salvos from the heavy handed Okoth. Round two see Okoth charge from his corner before swinging wildly in a effort to gain a semblance of control. Balker kept calm and stayed out of trouble by moving out of range and occasionally letting rip with accurate lefts and rights that slowed the advancing Okoth considerably. Round three see Balker step things up a notch and just plain out box Okoth with crisp jabs and wicked combinations. Each time Okoth advanced Balker would let him back him onto the ropes before spinning Okoth and launching a controlled attack of his own. Often to the head but sometimes with a peach of a three punch combination that ended with a solid left to the body. Round four was more of the same and it was no surprise that come the final bell the referee declared Balker the winner by a clear 40-36 points margin. Before the break Redhill’s Daryl Setterfield had a short and bloody battle with Jay Morris. Prior to the fight stopping cut there wasn’t much to choose between the two as they slugged it out. However the turning point came about three quarter the way through the first round after an accidental clash of heads. Blood gushed from a nasty cut above Setterfield’s left eye and in an instant Morris was all over him like a rash. Setterfield covered up, protecting the wound from possible more damaging blows, and soaked up the pressure until the bell. World class cuts man Jimmy Tibbs got to work on the badly damaged eye as Johnny Eames calmed Setterfield, who looked concerned by the extent of the bleeding. As the bell rang for the second round Morris shot across the ring and let rip with a series of massive bombs. However instead of covering up Setterfield returned fire with a brace of exocets of his own. Both returned to boxing, rather than attempting to take the other’s head off, but following another close quarter exchange a second accidental head clash reopened the wound, leaving referee Bob Williams no option but to stop the fight and declare the bout a technical draw. The third fight of the night was set to be a feisty affair, as both Sutton’s Danny ‘Cassius Connor and Stevenage’s Terry Holmes had publicly stated their intention of knocking the other out. Round one started fast, Connor using his superior jab to keep the raging bull attacks of Holmes at bay. Connor showcased his boxing skills whilst Holmes seemed content to throw bomb after bomb whenever he got in range, or not as the case may be. It was a close round but I felt that Connor had done enough to secure the round. Round two was more of the same, until around midway when one of Holmes’ bombs hit the target - hard. Feeling more confident Holmes went on the attack forcing Connor back. Connor continued to use his jab to keep the terrier like Holmes at bay, however Holmes just wouldn’t back down. I see the round in favour of Holmes. Things settled down a bit in the third round and some good toe-to-toe action ensued. Holmes slowed things down a bit and instead of launching wild attacks started picking his punches. 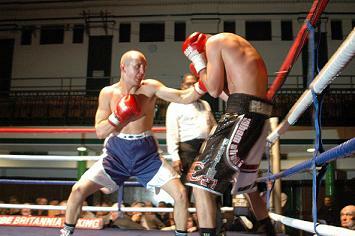 Connor was boxing beautifully but the tide had turned firmly in favour of Holmes with his more controlled approach. Round four was more of the same again and at one point looked like Holmes may have the stoppage he predicted after landing a big right before pouncing on Connor with a flurry of big shots. Connor weaved and ducked but with his back to the rope didn’t seem to have an escape route so let rip with a few of his own. This was enough for Holmes to take to the back foot. Connor pushed forward and let rip with a salvo of his own. The crowd were on their feet as the action flowed back and forth until the final bell rang and Holmes was declared victor by a 40-36 points margin - whilst I agree Terry Holmes won the fight I don’t feel it was a four round shutout. The second bout of the night see a massive upset as Navid Iran lost his unbeaten record to Mansfield’s Alex ‘Pit Bull’ Spitko. The early going was all Iran, who dominated with vicious two handed attacks. At around the midway mark of the first round it seemed the fight may already be over after Iran landed a massive right. Spiko’s legs were gone, but somehow the plucky Latvian exile stayed on his feet to weather the storm. The turning point of the fight came in the second minute of the third round when Iran seemed to run out of wind. Spitko turned the tables big time and let rip with a full blown salvo, Iran tried to run but Spitko stayed on him like a rash throwing flurries of shots until the referee Bob Williams stepped in to stop the fight at the 2 minute 39 second mark. 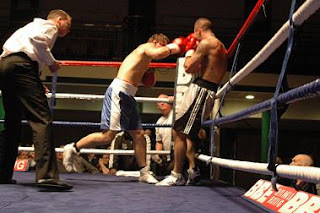 The opening fight of the night, between Joe Hillerby and Ryan Clark, also featured a battle of former World Champions turned trainers, as Graham Earl was in Hillerby’s corner and Carl Greaves in Clarke’s. The normally fast starting Clarke seemed a little more cautious than normal, which allowed Hillerby to take the first couple of rounds by forcing the pace throughout. Round three see the real Ryan Clarke emerge. Normal service is resumed as Clarke starts letting rip with heavy hands. Hillerby is made of sterner stuff though, standing his ground and trading with equal venom. Much closer round but Hillerby still gets the nod and is set for a good win. More of the same in fourth with Clarke throwing everything but the kitchen sink in an effort to stop the advancing juggernaut known as the ‘Belfast Banger’. No surprise that Hillerby and Graham Earl come out the winners in this one. Without doubt Graham Earl is a man of his word as ‘Capital Punishment’ featured well matched bouts that produced plenty of drama and excitement, as well as a little controversy to keep everyone talking. So there you have it. 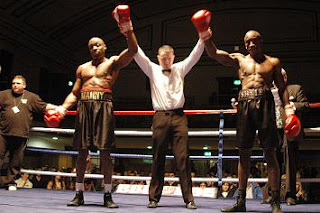 London’s first boxing show of 2011, can’t wait for the next - Bring it on!